Will Assembly Line Robot DJs Take Over for Turntablists? Not Yet. The last year has been full of new advancements in machine learning, automated jobs, and artificial intelligence. In a new heavily branded video making the rounds, a robot designed for vehicle manufacturing jobs “learns how to scratch” from DJ Yoda. 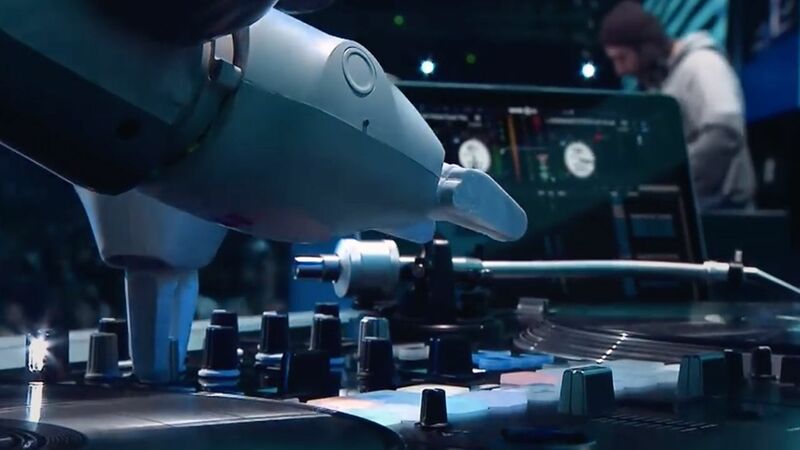 It makes for a unique advertisement – but turntablists shouldn’t be afraid of this robot. In the DJTT inbox this week was a new clip of a robot “learning how to scratch” from a DJ Yoda, a British DJ. The robot in question is called “YuMi”, a collaborative robot – built to work along with humans on an assembly line. Watch the video put out showing off the robot learning how to DJ below. Be warned, the video is very obviously an advertisement for the Ford Fiesta. Skip over that part! Notice that we don’t actually see very much action from the robot in this video. What we do learn is that DJ Yoda found one the hardest parts was communicating with the coders behind the robot – and teaching them how to code the bot to play in time with the beat. The performance starts with Yoda (also onstage, not seen in the beginning) scratching over nothing, YuMi moves the crossfader and plays a track, and Yoda cuts over the beat. There’s a few very basic baby scratches from the robot, and the two go back and forth for a bit. By the end of the routine, it’s clear to the viewer: this is a gimmick. The robot is playing a pre-set routine, and it’s not very refined. Maybe with more time from the coders it would be able to pass the turntablist version of a Turing Test, but it’s an awkward performance to anyone with a sense of timing. Read more about the Scratchbot in the video above in this DJTT feature. Couple this with a bit of artificial intelligence that has processed thousands of scratch routines. Then teach it how to create phrases and sequences on the fly, and you could genuinely have a cybernetic version of Qbert in just a few years. Entering a robot to compete in the 2017 DMC World Championship isn’t that crazy of an idea – someone just needs to make it happen. Know of a legitimate development in robotics or AI that would be interesting to DJs? Let us know in the comments!